Cantonment Board Public School And College Sialkot Punjab. Qualifications/ Pre-requisites: Minimum BSc (in relevant subjects) with 5 years' teaching experience in a reputed institution. 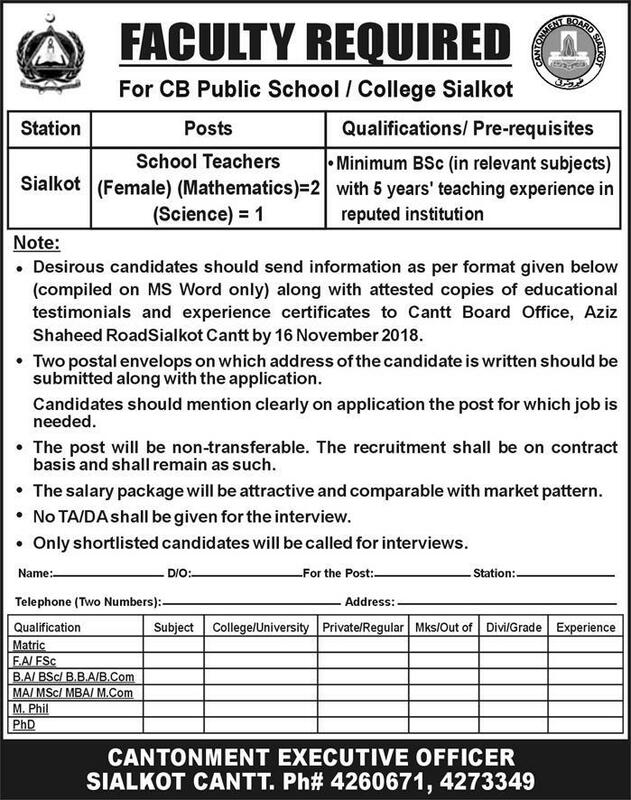 • Desirous candidates should send information as per format is given below (compiled on MS Word only) along with attested copies of educational testimonials and experience certificates to Cantt Board Office, Aziz Shaheed RoadSialkot Cann by 16 November 2018. • Two postal envelops on which address of the candidate is written should be submitted along with the application. Candidates should mention clearly on the application the post for which job is needed. • The post will be non-transferable. The recruitment shall be on contract basis and shall remain as such. • The salary package will be attractive and comparable with a market pattern. • No TA/DA shall be given for the interview.